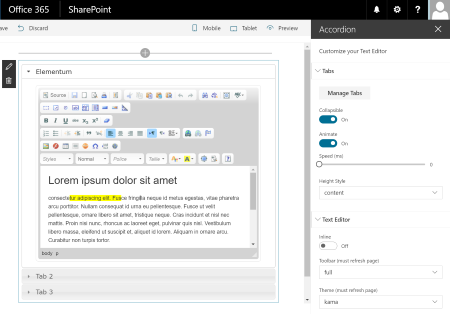 The Accordion Web Part is a SharePoint client side web part built with the SharePoint Framework (SPFx). This web part helps to create an accordion control (you manage, add, delete, edit or move a tab dynamically) and the web part editor can easily modify the tabs content thanks a HTML editor (WYSIWYG). This web part uses the jQueryUI and FCKEditor. heightStyle: manages how to render the content of a tab. The value can be 'auto', 'fill' or 'content'.